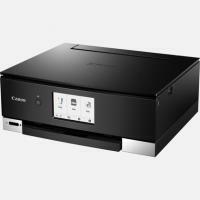 Canon Pixma TS8250 is a classic black printer with a space-saving design. The printer has 6.6 Kg weight with 373 x 319 x 140 mm physical dimensions. Also, the printer is embedded with 4.3 inches LCD touchscreen for easy navigation, when you want to perform print/copy job directly from the printer. The 2-way paper feed is an add-on of this compact printer. The input rear tray can handle a maximum of 20 photo sheets or 100 plain sheets. The front cassette can bear a maximum of 100 plain sheets. The printer works well with wired and wireless connection both. Using Google Cloud Print, Apple AirPrint, Wireless Direct one can easily perform the print job from wherever they are. The Pixma TS8250 printer provides good printing speed of about 15.0 ipm from monochrome and 10.0 ipm for colour Print. The print resolution of this printer is 4800 x 1200 dpi. To provide accuracy in colours, the printer uses 6 separate Canon Pixma TS8250 ink cartridges. The XL or XXL sized cartridges can reduce the overall expense of the printer. With the best quality print of square photos, magnets, and stickers, you can also design your own nail decorations using nail sticker media and app. Canon Pixma TS8250 printer is a multifunctional printer which offers various features for easy accessibility. The printer uses 6 Canon Pixma TS8250 ink cartridges to provide top-notch quality prints. The printer with seamless aesthetic and space saving design, it is highly preferred for performing printing task at home offices. How to resolve the problem, if the ink does not come out of the Canon Pixma TS8250 ink Cartridge? There can be many reasons for this problem. To fix such issues you should do the following checks. Make sure the power button is on and it displays on the home screen. Select the hint icon shown on the home screen of the printer, it will take you to the hint menu using the operational panel. To check the approximate ink, select the Estimated ink level in the menu. The sign will appear on the screen to indicate ‘ink low status’. If the ink is running low, prepare for the new ink cartridges. Note: The resulting print quality will not be according to your expectation if you are printing under ink low condition. To purchase the pack of compatible Canon Pixma TS8250 ink cartridges, visit us and add the respective cartridges in the cart. You need to connect the internet for this process. If you want to check the number of your Ink cartridge, click on the Ink number. It will take you to a screen where you can check the ink number. You can check the ink status on the touch screen while printing. You can also check the ink status on your computer screen. a. Open the printer driver setup window. b. Launch the Canon IJ Status Monitor. c. On the maintenance tab, click view printer status. d. It will display the estimated ink level. a. If you select printer status from remote UI, a dialogue box will appear that illustrates the estimated ink level. Step 2: You need to check if the protective plastic wrap is peeled off and exposed to the Y-vent area. Step 3: Print the nozzle check pattern to determine whether the ink from Canon Pixma TS8250 ink cartridge, ejects properly. If the nozzle check pattern is not printed correctly, perform print head cleaning. Q. Does Pixma TS8250 printer occupies more space due to its dual feeder? A. Pixma TS8250 printer has a small footprint with 13.9 x 37.2 x 32.4 cm dimensions. It does not occupy extra space due to the dual feeder. Q. I want to purchase a multipack of Canon Pixma TS8250 ink cartridges. But, before that, I want to read your terms and conditions. Please share the link. A. To read our terms and conditions, click here. For further information, you can also call us at 048 30833221. Q. Is the print quality affected if I use compatible Canon Pixma TS8250 ink cartridges? A. The print quality is not at all affected if you choose cost-effective compatible ink cartridges. In fact, the compatible ink cartridges are the same as original ones, as it has to pass several tests prior to final production. Q. I am having slow printing issue in Canon Pixma TS8250 printer. What can be the issue? The printer must be performing the printing task from another computer. The printer must be placed too far from the wireless range. Q. A week ago, I had purchased canon ink cartridges from your site in bulk. Out of them, one of the ink cartridges was faulty. How can I return the faulty product? A. If an item fails to operate within 30 days of purchase call us at 048 30833221 or email us at info@printerinkcartridges.ie. Our team will replace the product or refund the amount once the item has been returned to us and tested. Q. I want to replace the ink cartridges purchased from your site. Please guide on the same. A. To replace the ink cartridges, you must have your order ID with you. Click here to fill the form. Our team will contact you and will replace the ink cartridges. Make sure the product should not be damaged.